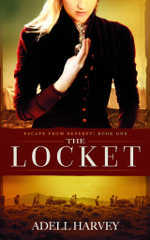 The Locket, the first novel in the Escape from Deseret series by Adell Harvey, sheds light on the Mormon church’s early history. This historic novel is set in the 1850s when thousands of poverty-stricken Scandinavians were lured to America and promised prosperity by Mormon missionaries. It tells the story of 16-year-old Ingrid Thirkelsen, an orphan who marries a “widowed” Mormon missionary. As she makes the trek across the Plains and Rocky Mountains, Ingrid learns the truth about this new religion – the horrors of polygamy, blood atonement and blind obedience to cult leaders. her only comfort is her mother’s Bible and a locket that she promised to deliver to a young girl in Zion.